Researchers at the Swiss Federal Institute of Technology in Lausanne, have published a picture is shown on the light in both waves and in particulate form. This is not a Photoshop creation but rather the result of a sophisticated experiment: the researchers bombard a metallic nanowire laser pulses. Thereby the atoms are excited in the wire, whereby energy flows in the form of light in both directions along the wire. Thus a new, apparently standing light wave produced by superimposing the two traveling waves of light in opposite directions. This wave illuminates the experiment at the same time for the researchers. To make the wave itself visible, the scientists have the wire additionally bombarded with electrons. Some of these electrons interact with the photons of the light standing wave. With a highly sensitive microscope, minute variations in the velocity of the electrons caused by this interaction, are made visible to form an image of the standing wave. At the same time the electron bombardment is also used to make the light particles visible. 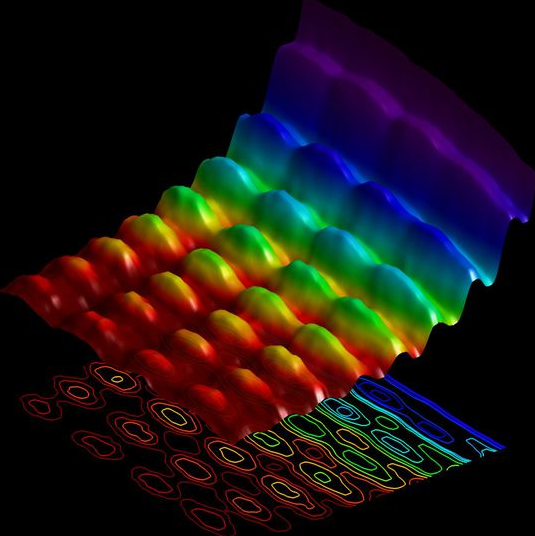 The electrons in the vicinity of the standing wave on the photons of the emitted light. This makes changes as described in the velocity of the electrons. This change can be used as an exchange of energy packets, or quanta, are explained. Due to the exact location of speed changes, researchers can determine the position of the photons. The result is the picture that is shown above and the light is a wave and a particle. To attach a photo in the strict sense, these are not, rather it is a visualization of the data of the experiment from Switzerland. “This experiment shows for the first time ever that we can film quantum mechanical processes directly, despite its paradoxical nature,” the researchers Fabrizio Carbone says in a press release of the Federal University . From the result, scientists hope new possibilities for quantum computers. “The ability to be able to represent quantum phenomena at the nanometer scale and directly control opens up entirely new possibilities,” says Carbone.